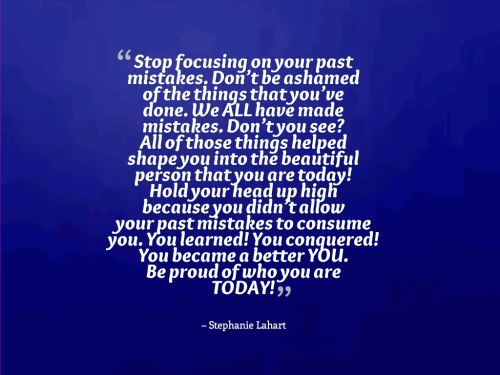 Stop focusing on your past mistakes. Dont be ashamed of the things that youve done. We ALL have made mistakes. Dont you see? All of those things helped shape you into the beautiful person that you are today! 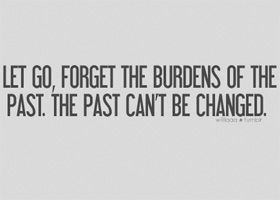 Hold your head up high because you didnt allow your past mistakes to consume you. You learned! You conquered! You became a better YOU. Be proud of who you are TODAY! In order to make the most out of your life, you must first take control of your life and not let people's opinions or your past negative experiences shape the direction your life is headed in. Once you do that, just set your mind on your goal, reach for the stars and you will accomplish your dreams!